The species is found in Turkey, Lebanon and Iran. The taxonomic status of the species is still a subject of discussion: while some authors consider the species Turanana endymion (Freyer, 1850) with the subspecies T. e. panagea Herrich-Schaffer, 1851, the others consider Turanana panagea as a species represented with subspecies T. p. ahasveros (Bytinski-Salz & Brandt, 1937). The Odd-spot Blue inhabits calcareous mountain steppes of Central and Southern Armenia at the elevations between 1200 and 2200 m a.s.l. The host plants used by the species belong to Acantholimon spp. The butterflies are recorded on wing from early June till late July depending on elevation. The species is uncommon to rare within typical habitat, although males make some congregations at the watering places. During 2003-2013 the species shows stable population trend (p>0.05), which is most probably justified by the character of the host plant - thorny herb, which is not eatable for the livestock. The species is not included in the Global, European, and Armenian Red Lists, as well as in CITES and Bern Conventions. Preliminary assessment of its national conservation status suggests it as Least Concern. At current the distribution of Odd-spot Blue is partly covered by Khosrov Forest Reserve and Gnishik Protected Landscape as well as appropriate Emerald Sites. 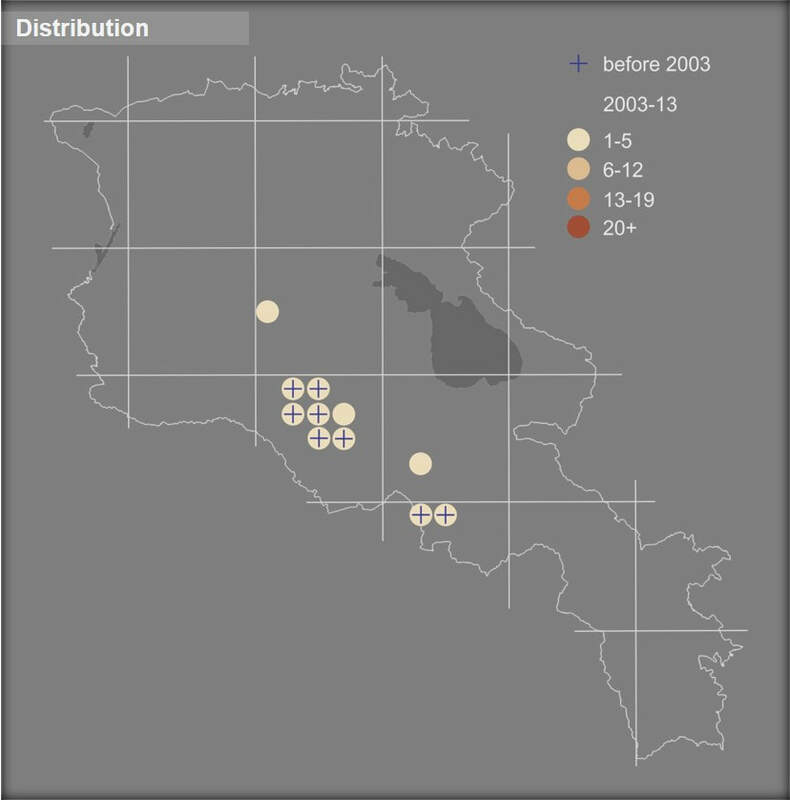 The species is presented in Gnisheek and Ourtsadzor Prime Butterfly Areas. As appears there is no need for development of special conservation measures, however it is important to continue the species' monitoring as a specialist of calcareous mountain steppes.